The Willowherbs (Epilobium sp.) are a bit of a nightmare to identify. There are 12 species growing in the UK and some of these are not often found in woodlands, so we have 5 to deal with. Two are quite easy to identify and they are Rosebay Willow herb and Greater Willow herb, and for the record Rosebay Willowherb despite its name is in another genus, it is Chamerion augustifolium. So we have Broad-leaved Willowherb, Pale Willowherb and American Willowherb, which you might encounter in a woodland. They all have similar flowers which are small pink and with four petals, they are produced on the end of a long narrow ovary which becomes the seed capsule. To identify them we need to consider other characteristics. Square stem or round stem. Only two species have a round stem and they are Hoary Willowherb and Broad-leaved Willowherb. Now Hoary Willowherb is not really found in woodlands, it likes damp soils and alkaline soils, it also has quite hairy leaves. So a Willowherb with a round stem growing in shady, woodland places is Broadleaved Willowherb. Do not think that its leaves are particularly broad, they are just a bit wider than the leaves of some other willowherbs. Now we have to distinguish between Pale and American Willowherbs, (both have square stems). They also both have quite pale pink flowers, the Pale Willowherb does have slightly paler flowers but it is marginal so not much help in identification. The one thing that will separate them is the presence of a leaf stalk (petiole) or not. 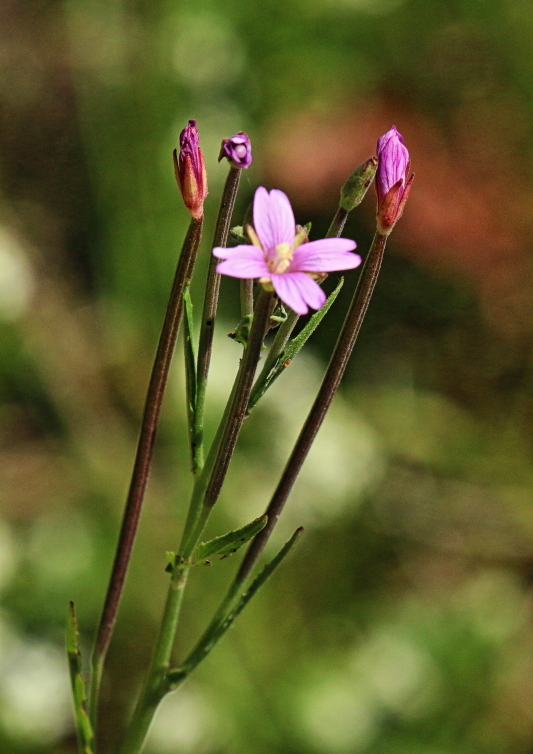 The leaves of the American Willowherb do not have stalks and are attached directly to the main stem. Pale Willowherb leaves do have quite a long stalks. Another way to differentiate these two is that American Willowherb has stems which are quite red in colour, Pale Willowherb does not. However there are other Willowherbs with red stems like the Broad-leaved Willowherb. The photo to the right clearly shows a square stem and leaves which do not have a petiole, also the stem is red/purple so this is American Willowherb. OK having worked out how to separate them lets look at the individual species a bit more closely Pale Willowherb (Epilobium roseum) is perhaps the least impressive but is also the least common. It has been recorded in 3 tetrads along the Wye Valley but is not found everywhere, by any means. Possibly this is because it gets overlooked. It is also the species which is more likely to be found in woodlands. I have not yet found it in the Wye valley Gloucestershire/Monmouthshire area. It flowers in July and August so I will be keeping an eye out for it. 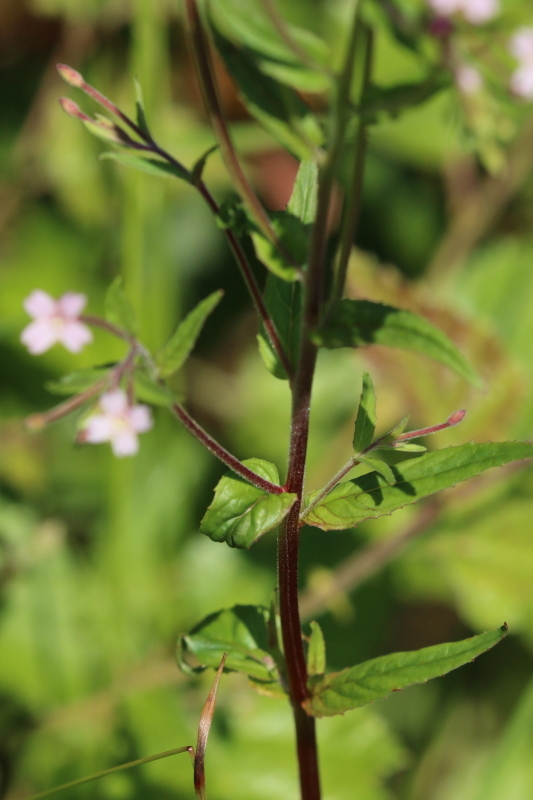 American Willowherb (Epilobium ciliatum) is from America …what a surprise! It’s been here for some time and is a perennial herb which is found on disturbed ground such as in gardens, shrubberies, felled woodland, waste ground, on walls and in pavement cracks. It spreads readily by seed, often colonising newly disturbed sites. I have a lot of it growing in my patch of Ninewells wood, which is after all felled woodland. This species was first collected in 1891, but was unrecognised until the 1930s. It established itself most strongly in south-east England, and has spread rapidly north and west. Finally lets consider Broad-leaved Willowherb (Epilobium montanum) , I have loads of this growing as a weed in my garden. It spreads with seeds and then once established it can spread with horizontally growing rhizomes, so it will form a little patch, It is perennial so is quite difficult to eradicate, fortunately its roots do not penetrate too deeply so you can pull it up fairly easily. It will grow up to about 70cm high and just produces a small number of pink flowers, so it is not that attractive. It is a plant which will tolerate some shade, so it is to be found in woodland glades and edges also hedge banks but as I have said it is also a garden weed. It is quite common but unlike American Willowherb, this species is British so we have to put up with it. The photo at the top of this piece is of Broad-leaved Willowherb. I will finish off by saying that these species will all interbreed so that can add to the difficulties with identification… If in doubt, just say ‘It’s a species of Epilobium, possibly a hybrid’ and that will make you sound as if you know what you are talking about, even when you don’t.